visage|SDK and Visage Technologies solutions are fully compatible with the rapidly growing smart mirror market and various applications built for them. 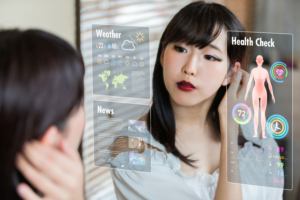 As the number of industries utilizing smart mirrors is ever-growing, and the most represented industries at the moment are retail, beauty, healthcare, fashion and automotive, we decided to adjust our tracking, analysis and application solutions to the required formats, which lead to highly improved user experience and performance. Since each smart mirror product differs depending on usage type, target audience and complexity, we are positive to meet all of your requirements – our solutions can be tailor-made for your project and we support all major platforms like Android, iOS, HTML5, Windows, Linux and others. We’ve offered our virtual makeup try-on and eyewear try-on solutions to many retailers, software providers and multiple marketing campaigns so be sure we have the required knowledge in design, features, functionalities and e-commerce integration needed for a high-end product.